Colonel John O'Connel was educated at University College Dublin, National University of Ireland from where he qualified MB ChB in 1931. On 26 October 1934, he was accepted for the Short Service Commissions Probationary Course for the RAMC. 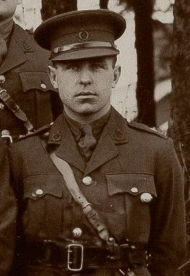 He entered the RAMC College Millbank on 1 November 1934 and the RAMC Depôt on 1 January 1935. He was appointed to a Permanent Commission on 30 October 1939 (London Gazette 24 November 1939). 25 Oct 1934 Appointed to a Short Service Commission Lieutenant RAMC on probation. Malta 9 Apr 1935 Arrived from England. 30 Oct 1935 Promoted Captain RAMC with retained seniority from 30 October 1934. Malta 25 Aug 1936 Left for Palestine. 19 Dec 1936 Returned from Palestine. Malta 25 Feb 1937 On home leave. 4 June 1937 Returned from leave. Malta 9 Oct 1938 Left for Palestine. 30 Oct 1939 Appointed to a Permanent Regular Army Commission Captain RAMC (London Gazette 24 November 1939). His Short Service Commission having expired on 29 October. 14 Feb 1940 Acting Major RAMC. 14 May 1940–29 Oct 1943 Temporary Major RAMC. 30 Oct 1943 Promoted Major RAMC. 1944–1947 Served in India and Burma with the Allied Land Forces South East Asia. 17 July 1945 Acting Lieutenant Colonel RAMC. 1945 Commanding Officer 11 Indian Field Ambulance. 17 Oct 1945–3 Jan 1948 Temporary Lieutenant Colonel RAMC. 1945–1946 Commanding Officer 51 Indian Field Ambulance. 1946–1947 Commanding Officer 4 Field Ambulance. 1947 Commanding Officer Combined Military Hospital Lahore Bahru. 7 Aug 1948 Promoted Lieutenant Colonel RAMC. 1948–1950 Commanding Officer British Military Hospital Iserlohn. 1950–1952 Commanding Officer 29 Field Ambulance. 31 Jan 1952 Temporary Colonel L/RAMC. 1952–1953 Assistant Director Medical Services HQ 7 Armd Division British Army of The Rhine. 1953 Assistant Director Medical Services HQ 3 Infantry Division Middle East Land Force. 3 Nov 1953 Retired on retired pay and was granted the honorary rank of Colonel. 21 Mar 1964 Ceased to remain on the Regular Army Reserve of Officers having reached the age limit for liability for recall but retained the honorary rank of Colonel. Entry No: 1578. Drew R.,1968. Commissioned Officers in the Medical Services of the British Army 1660–1960, Vol II Roll of Officers in the RAMC 1898–1960 London, Wellcome Historical Library. Succession Books Vol XXVIII, Returns of statement of service of RAMC Officers. Volume of particulars of candidates for RAMC commissions (RAMC/1308).